This Summer at Hammersmith saw a change from the usual downtime that accompanies the end of the league season and the long wait for the new one to begin. 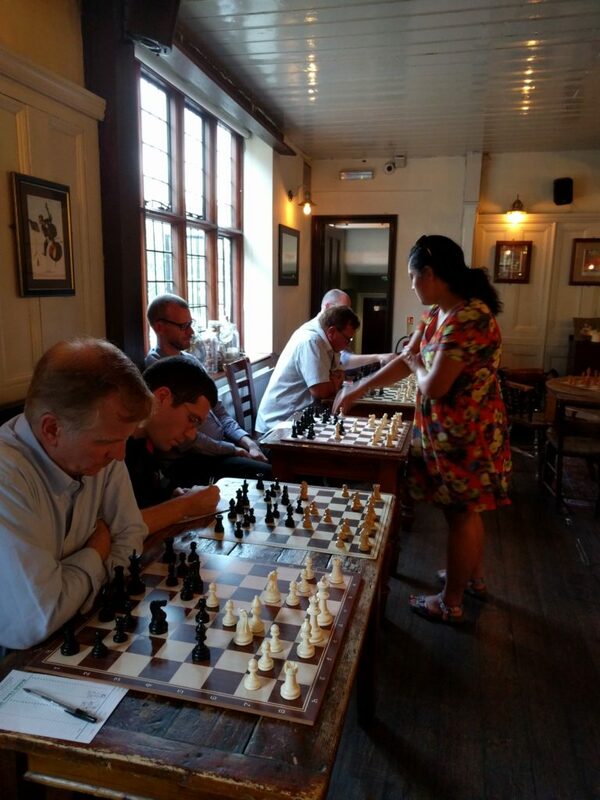 Members were lucky enough to take part in a number of events involving competitive – and in some cases not-so-competitive – chess during July and August. Club Sec Mike Mackenzie presents a summary. 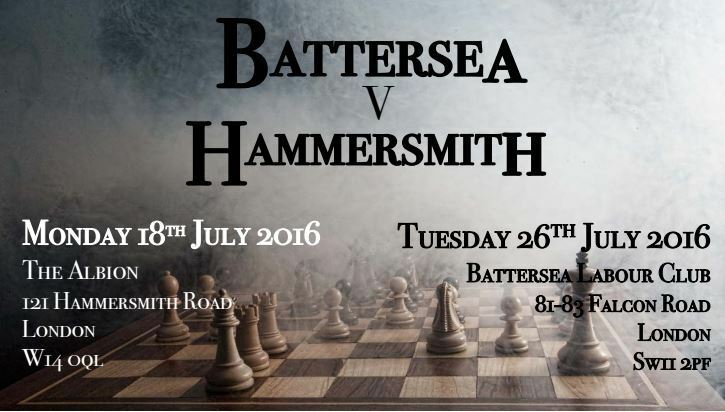 A special evening of chess saw Hammersmith take on Battersea in the first game of our Summer double-header, dubbed “El-Chessico”. Members of both clubs seemed very much up for the event, with 12 boards turning out for this rated game at the Albion Pub. Full report can be found here. Our inaugural Summer double-header against Battersea saw 26 boards across the two games! This scorching hot evening saw a splendid simultaneous over 14 boards by our very own Sue Maroroa. An excellent turnout, coupled with Sue generously waiving her fee and donating it to the club, saw a thrilling evening of chess. Full report can be found here. Sue Maroroa – knows a thing or two about chess! The concluding game of El-Chessico saw a huge turnout at Battersea’s home venue in darkest South-West London. 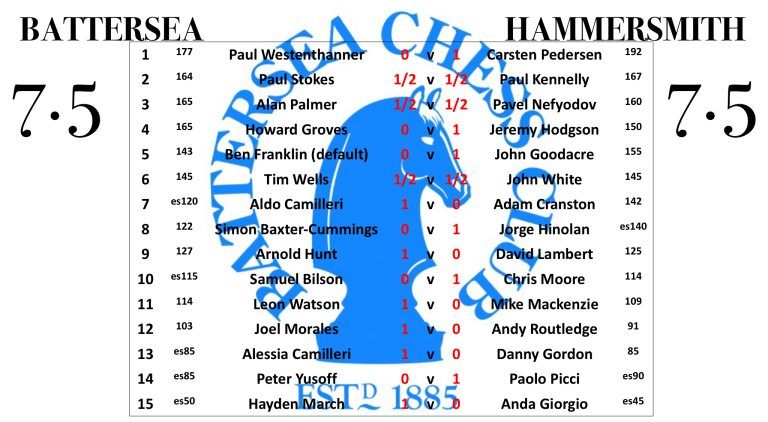 Fully 14 boards took part in this second leg as Battersea sought to salvage some pride…. Full report here. Saw 7 members turn out at the Albion pub for an evening of chess. 9 members showed up for what turned out to be a very interesting evening of chess. John, Mike, Jorge, Paolo, Shaun, Javid, Tomas, and Matt turned out, along with top club player Carsten, who was kind enough to analyse several games played by the other members, as well as enjoying a spot of recreational chess himself. A whopping 13 members showed up at the Albion, plus Danny’s flatmate, and new recruit Matteo. 8 members including John, Mike, Phil, Anda (our terrific library organiser! ), Rich and Jorge turned out for the evening, plus a graduate from one of our library evenings, Marc, came down to see what it’s all about. Pavel also turned up and sadly let us know he’ll be moving back to the Midlands in the next few weeks. Best of luck Pavel! No chess due to the Bank Holiday! Next Next post: 2016/17 Fixtures, and some updates!